Another week, another DHD. Hope you enjoy! 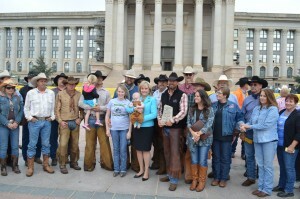 I made a visit to the Oklahoma State Capitol this morning (Friday, Oct. 23) for the Baptist Messenger to cover an interesting visit between Governor Mary Fallin and a group of cowboys who traveled 109 miles from Wichita Falls, Texas on horseback to deliver to the Oklahoma Governor a special gift. John Riggs, pastor of Texoma Cowboy Church in Wichita Falls, Texas, left Tuesday, Oct. 20 with a group of horsemen to deliver a special “monument” of the Ten Commandments to the Gov. Fallin. I was pleased to observe the formal meeting in front of the Capitol building, as Pastor Riggs expressed his disappointment with the removal of the Ten Commandments monument from State Capitol grounds earlier this month. The Governor shared the pastor’s grievances. They ended their meeting with a time of prayer and a photo shoot. “God give you peace and safety as you ride back home,” Gov. Fallin told Riggs and his fellow cowboys before they mounted to head back south. Former Secretary of State and current Presidential Candidate Hillary Clinton met with the House Select Committee for the hearing on the tragic incident in Benghazi three years ago. Some of the highlights from Thursday’s hearing involve South Carolina Congressman Trey Gowdy, the committee chair, interrogating the madam secretary. I confess, I enjoy watching Gowdy interrogate people. It’s quite entertaining, and I knew once he had the chance to question Clinton, it would be worth grabbing the popcorn. It appears Gowdy struck a nerve when he brought up email exchanges between Clinton and Sydney Blumenthal, who is identified as a friend of Clinton and her husband but, according to Mrs. Clinton, NOT an advisor. Gowdy did not disappoint as he was gaining ground, since it appeared his purpose was to reveal Clinton’s relationship with Blumenthal was a matter of concern because it appeared Blumenthal wanted to do some kind of business in Libya. It also was a matter of concern because here is somebody who wasn’t a government official talking shop about Libya with the Secretary of State while the U.S. Ambassador to Libya, Chris Stevens, a subordinate to Secretary Clinton, had no direct contact with her, as he made multiple requests for more security. Then, Maryland Congressman Elijah Cummings swooped in and caused a distraction, asking for Blumenthal’s complete transcript. Though it was a distraction, and one that will probably get too much media play, Gowdy kept at point stating Blumenthal’s emails were not directly being discussed; rather it was Clinton’s emails, which involved communication with Blumenthal. Bravo, Mr. Gowdy. You, sir, are becoming a U.S. Congressional legend. All of this to say, the hearing did not reveal much earth-shattering information, and however people think about Hillary Clinton and her role as Secretary of State, or how they lean toward Democrats or Republicans, I don’t think views were changed after Clinton’s appearance in front of the committee. But here is something you have to ask yourself. Has Hillary Clinton demonstrated herself worthy to be the next president of the United States? Do you think she has the character qualities that define a true leader? Of course, MacArthur did not single out anybody in particular. In fact, he is pretty much expressing disappointment with the whole leadership crop. But I find it hard to believe anybody would think Clinton presented herself to the House Select Committee in such a way to conclude she demonstrated moral character during the Benghazi tragedy. I was quite wordy with topic 2, which means the remaining four will be brief. Cameron Whaley gives an excellent assessment for Christian Sports Fans in Sunday Sports Hangover, his debut blog on WordSlingers. I definitely appreciate his third point “Your actions impact others.” Always remember to handle wins and losses graciously. I did go see the movie Woodlawn last weekend, and I highly recommend it. My movie review will be featured in the Oct. 29 edition of the Baptist Messenger, but I will offer just a snippet of what I wrote and say this is much more than a football movie and could be the best of the faith-based films. You’ll have to read my review next week to get my explanations. I received information that today the U.S. Congress is schedule to vote on a special fast-track bill (H.R. 3762) that would cut off nearly 90 percent of the federal funds that to go Planned Parenthood – about $400 million. I will be curious to see if this will pass. Lord, may Your will be done. Trevin Wax is one of my favorite bloggers. He gave an excellent explanation on the famous proverb “Train up a child in the way he should, and when he is old he will not depart from it” (Prov. 22:6). He shares the appropriate way to apply proverbs and a wise perspective for parenting in Train Up a Parent.